We love Burger Project! If you managed to get to the Australian Open over the past two weeks, you would have noticed their van set up, slinging tasty burgers to all the sports fans out there! Well now they’ve finished acing the crowds there, and are now bringing Chinese New Year to life with its latest limited-edition burger, the Peking Chicken, which is on offer from Monday, 4 February to Sunday, 31 March. 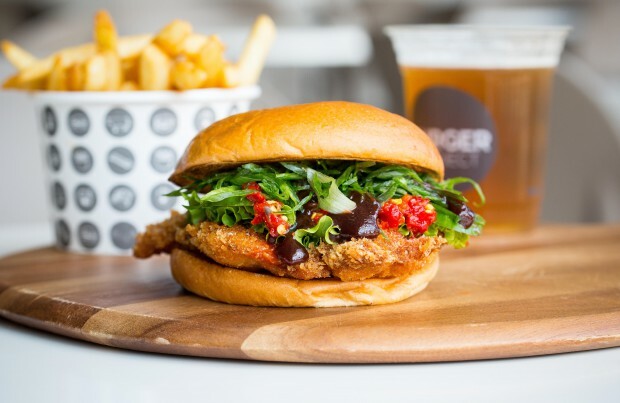 The Peking Chicken burger ($14.90) comprises of free-range crumbed chicken, salted chilli and a generous layer of house-made hoisin sauce. This authentic combination of Chinese flavours is sandwiched between a soft milk bun, alongside fresh slices of cucumber. Mmm we can already taste it! Burger Project is also pairing the new limited-edition burger with a bottle of Tsingtao beer, a light and crisp brew with subtle, honeyed notes. This perfectly partnered combo comes with a serving of Sichuan pepper and salt chips ($23.50). Burger Project is located in Melbourne at Bourke Street, Chadstone and St Collins Lane. Visit the website for further deets.